For the poker enthusiast, enjoyment is definitely linked to a reliable system. The best operator will be equipped with all of the tools you need to enjoy every single second, of every single game. Here is a look at the top Canadian poker software’s to help you improve your game and track your odds. Poker software is useful for helping you keep track of your individual poker profile. Software gimmicks such as poker trackers and odds calculators can make it easier for you to keep track of multiple games as well as your most common moves and unfortunate errors. A poker tracker is a hi-tech software bundle. It runs in your desktop background as you play poker online. The tracker records your moves as well as your opponents moves. It can help you spot their weaknesses as well as your own, thereon improving your play. Most tracker software will give you several graphs to view your progress. It’s as close as you can get to a bulletproof strategy. An odds calculator is useful to provide already calculated statistics. While you play, it runs in the background, and gives you insight on your odds of winning at every stage of the game. Poker Tracker is a result tracking software. It gives you the history of your dealt cards along with analysis and statistics. It also has basic heads up HUD display. This means you can view the statistics on top of your online poker table. The Audience for Poker Tracker is for beginner to intermediate poker players. Another great feature is the ‘community’ tab. That’s where you find video tutorials and a site configuration guide. The interface provided by Poker Tracker software is pretty basic, so you will need to be familiar with this type of software. There is a lot of redundant clicking to find menu items. reviews prove that some players find it to be confusing. But at least the analysis given by the software is excellent. Poker Tracker comes with a 30 day free trial. After this you will need to purchase the software. The small stakes version is $99.99 and the Full version (for Hold’em and Omaha) is $159.99. 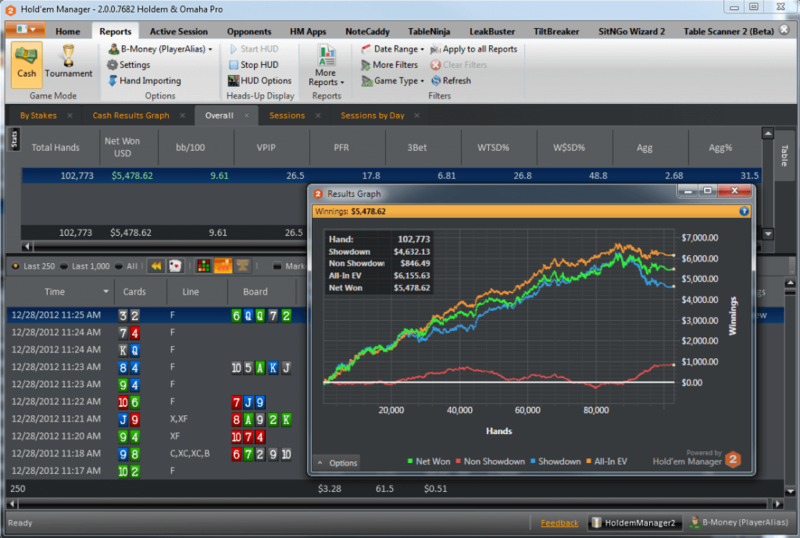 Hold ‘Em Manager offers result tracking in a software program where you can view the history of the hands played, along with analysis and statistics. It has an intricate heads up HUD display. This means you can view the statistics on top of your online poker table. The detailed Heads Up HUD display is more useful at intermediate levels and beyond. 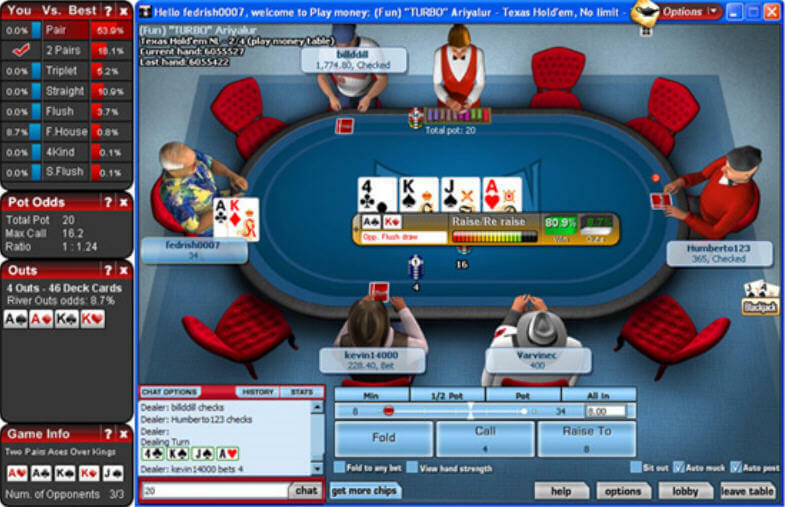 The display is easy to navigate in spite of the depth of information available with Hold ‘Em Manager. So if you’re new to poker software, but not the game itself, you’ll probably enjoy this program more than Poker Tracker. Start with a 30 day free trial. Then the program will cost you $59.99 for small stakes, and $89.99 for the full version. Magic Holdem is an odds calculator with poker coaching and tutorials. It is supported in more than 100 poker rooms. 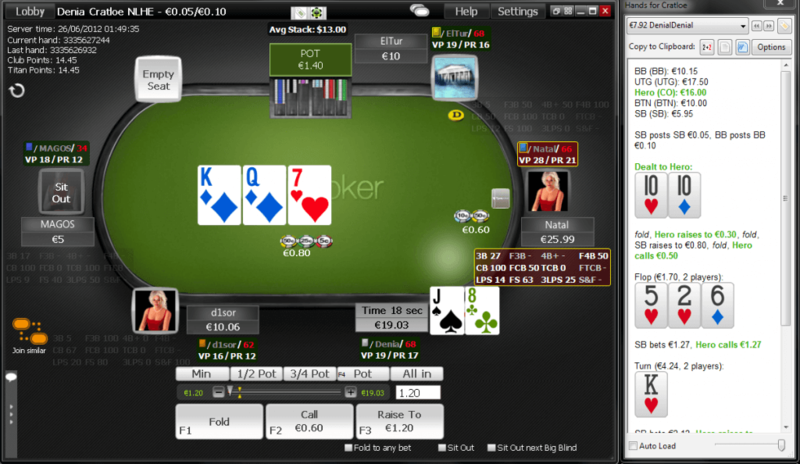 You can also use the software for Pokerstars as it’s on their allowed software list. Pre-session playing tips can really help get you started before the game. This software is very easy to use, whether you are new to poker software or an expert. It will display warnings in bold when Magic Hold ‘Em thinks it has figured out what cards your opponents may be holding onto. This helps a great deal for flush and full house determination. The personal poker coaching offered by the software’s AI (artificial intelligence) system is widely known to be very useful to new and much more advanced poker players. Pokeit is a web based tracker with detailed, interactive reports and hand replay options. 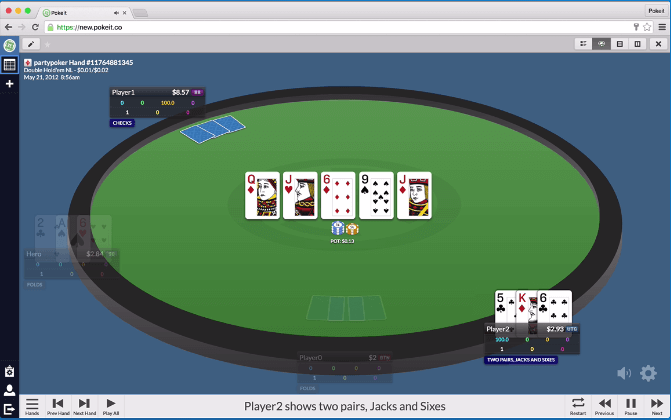 It offers unlimited hand storage online so that you can analyze your moves, wins, losses, and strategies over time. New and existing software users are sure to take to it with ease. It is an advanced odds calculator and poker tutorial system which can be accessed from any web based internet device. You can share your dealt cards with others via the internet, and gain valuable advice from forums. A great benefit is that you have the ability to access it anywhere you have internet using any device. The program you download is called “Poker client” that allows you to save your dealt cards and other database options. Poke It is free for the first 10,000 hands. After that, there are versions priced from $5 to $20 monthly. Once you’ve downloaded these top tools and softwares, check out the best online casinos to hone your new skills.